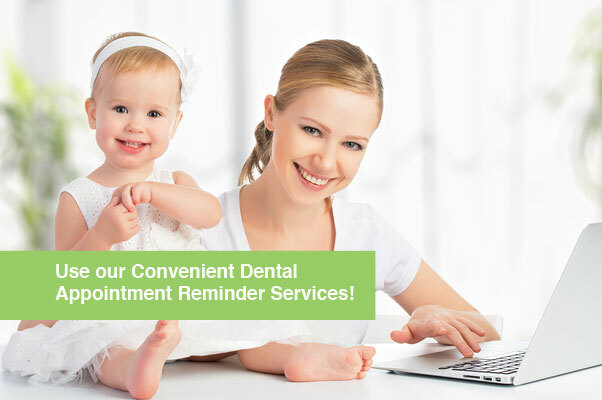 Appointment Reminders delivered to you the way you want via Email, Phone Call, Postcard or Text! Be sure to let our office know if there are any of these methods of communication you do NOT want to receive so we can deactivate that feature for your account. Only get the messages you want by responding to the 1st e-mail! ALWAYS click one of the links in the reminder email that we send you. DO NOT click your email “Reply” button to respond. We will automatically send you an e-mail after you schedule an appointment. Your response to the 1st e-mail is key and will let us know what other messages you want. If you ignore the email, you will get more messages! Please Note: when you do NOT respond to any e-mail message, we do not assume you read it, so the next message in the series will be sent. The next message may be another e-mail, postcard, phone call or text. Our 2-way texting feature let’s you confirm your appointment from your mobile phone. Simply reply with “C” and Dentistry For Children will automatically confirm your appointment. Any reply other than “C” will be converted into an Email to us. If you have a conflict and need to reschedule, please Call Dentistry For Children as soon as possible. Cancellations or changes are not accepted through text, please call our Gladstone office (816)548-3400! Need to make an Dental Appointment or Information? Please call (816) 548-3400 or send us a message using our contact us button.